Today we are looking at the iStarUSA BPN-DE350SS which is a 3.5″ tray-less hot swap mobile rack. 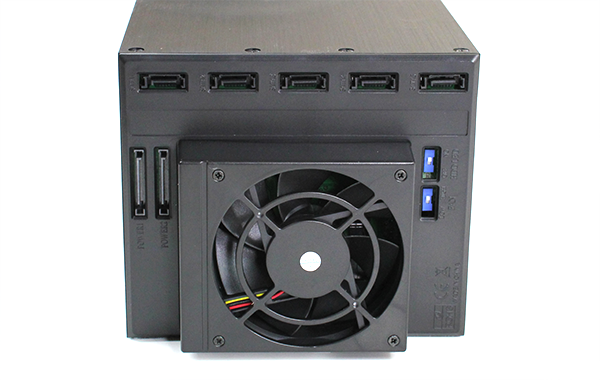 For those unfamiliar with this type of product, the iStarUSA BPN-DE350SS can be utilized in server and workstation cases to take three adjacent 5.25″ bays and turn them into five 3.5″ bays. Although 5.25″ bays are standard fare in both desktop and many server chassis, the need for multiple bays to house optical drives is much lower than it was ten years ago. With optical media being less of a critical feature, vendors have created mobile racks to allow the installation of multiple 3.5″ or 2.5″ drives. The other major feature of these units is the ability to hot-swap drives which makes installation very quick and easy. The iStarUSA BPN-DE350SS adds one other feature, a tray-less design. Let’s look at the unit. For this test we will use the recent AMD workstation platform. Overall a fairly standard configuration for custom-storage applications. 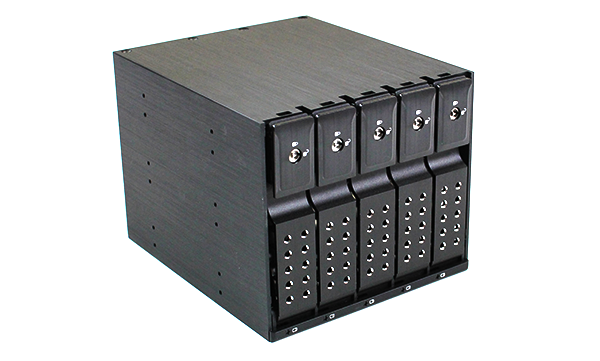 Core to the iStarUSA BPN-DE350SS is its ability to hold five 3.5″ drives in three 5.25″ drive bays. The unit is built around an aluminum frame which makes the iStarUSA BPN-DE350SS feel solid. There are portions of the unit made of plastic so this is not an all-metal design but the unit generally feels solid. It should be pointed out that the review unit sent is black, but the unit can be purchased with either blue, red or silver face plates. 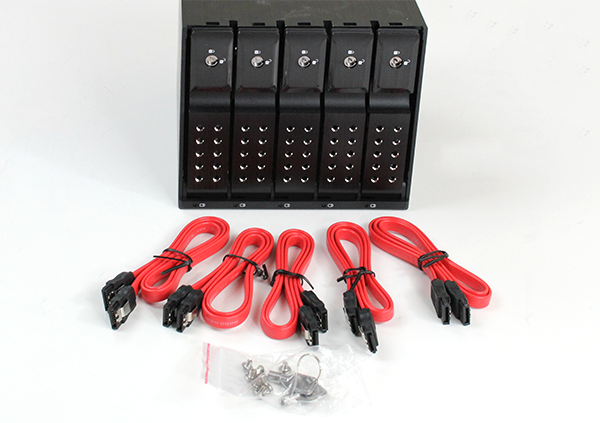 Aside from the main unit, the iStarUSA BPN-DE350SS comes with five 7-pin SAS/ SATA cables, keys and screws. In tray-less mobile racks, locking mechanisms are especially important because one does not want to accidentally remove the wrong drive. The rear of the iStarUSA BPN-DE350SS is a very standard design. An 80mm fan dominates the rear of the chassis. 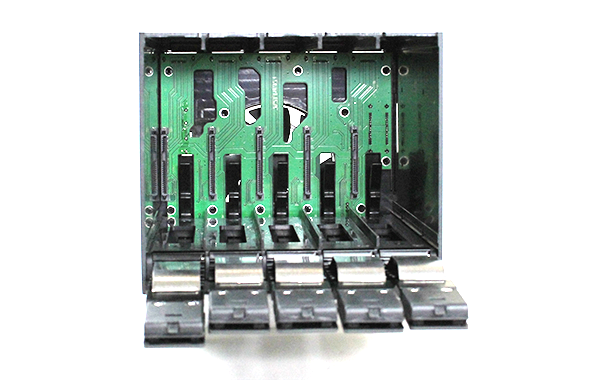 There are five SATA/ SAS 7-pin connectors along one edge. Two SATA power connectors feed the five drives which helps to simplify cabling. The blue switches allow one to optimize the fan’s speed for either quiet operation or high airflow while the other allows one to set LED functions. 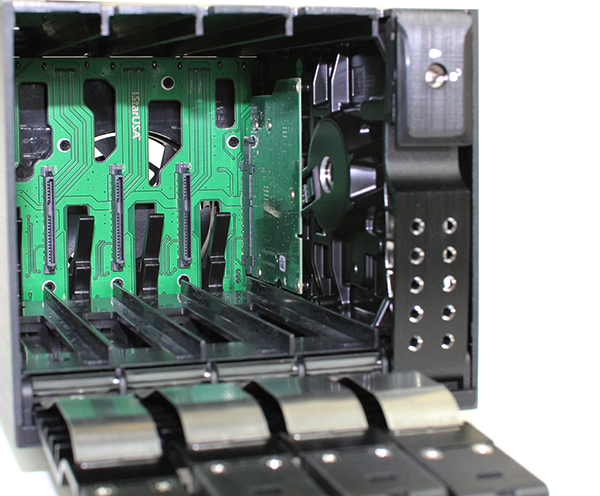 Inside the iStarUSA BPN-DE350SS is a PCB backplane that delivers power and data connections to each drive. One can see holes in the PCB to facilitate airflow. Also, there are spring loaded arms for each drive, next to the power/ data connectors in the iStarUSA BPN-DE350SS. These arms eject drives when the latching mechanism is released. With traditional designs where there are drive trays or caddies, one has the ability to pull drives out easily. With tray-less designs, it is important that the drives can eject a bit so they do not get stuck in the enclosure. Here is a Seagate 1TB drive installed in the iStarUSA BPN-DE350SS. One can see that it fits securely inside a slot. The latching mechanism closes and the spring loaded arm is compressed. One major benefit to the aluminum design is the fact that the chassis acts as a heatsink for the drives in conjunction with the 80mm fans. Overall the iStarUSA BPN-DE350SS is a solid option for those looking to add a tray-less 3.5″ mobile rack to their servers or workstations. When asked what color we wanted to review, the response was black, but from pictures the blue and red versions of the unit are very eye catching. 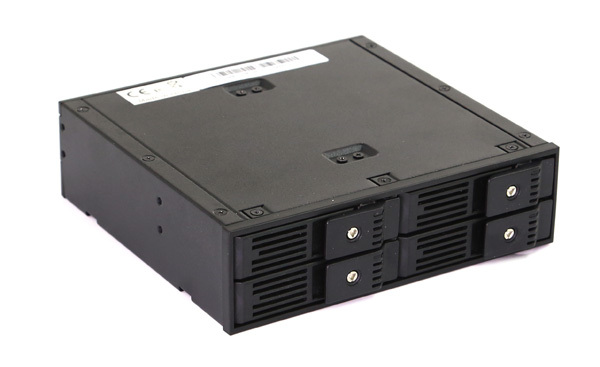 With the lessened need for multiple optical drives in a system, using 5.25″ mobile racks such as the iStarUSA BPN-DE350SS are a great way to reclaim that density while adding hot swap capabilities. Being able to access the drives from the front of a chassis means that drives can be replaced faster in RAID arrays. Time to replace drives is a factor in RAID reliability/ MTTDL calculations. Hot-swap mobile racks do impact this metric versus securing dries internally within the chassis. Just like some cheapo brand that I know of, use metal case for good looking, but plastic on key but not visible component, I mean the level that will push the disk out, I can see that shrinking scar(from cheapo injection molding plastic) very clear. I won’t trust that. And for naming itself with xxxUSA, I guess I can safely assume that this is just a dummy shell brand for some random cheap Chinese manufacturer. And again by looking at the PCB, SATA signal lines might not be equal in length, which might leads to connection problems. Used their products before. I think most of this stuffis made in china. Haven’t had problems with them before. IstarUSA is the US distributer for Istar, inc. Yes, they are a Chinese manufacturer, but there is no grand scheme to use the name to deceive anyone. I’ve used a number of their products and they are generally of reasonable to good quality. They are not an el-cheapo manufacturer. I own two of their earlier version of this same trayless enclosure. The major problem with the earlier one was the two small, loud 40mm fans. They didn’t move enough air, they were too loud, and they couldn’t be replaced when they died (as all fans eventually do…). This version appears to have fixed that problem. I got these as I wanted my box to be as pretty as commercial NAS’s on the market; which they are. I wanted to have them exposed actually – shame that such a nice finish is hidden in a box. Feels sturdy and well made. Also, I removed the fans – easy to do – for more space and low noise. Can’t say whether things will be cool enough yet. Only 1/2 as dense as the Norco boxes, so overall this is an aesthetics vs practicality choice. The review is worthless. No benchmarks, no test with all drive slots populated. I have read elsewhere that if you try to put 5 7200rpm drives in there and the entire unit is only powered by 2 sata power connections, YOU WILL HAVE TROUBLE. I guess I need to keep looking elsewhere. Drive temps at the various fan speeds would be nice to see, especially since a previous review, BPN-350SAS, from 2009 indicated that drives overheated in the enclosure. A follow up since I’ve been using one for four months. The 80mm fan keeps 5 7200 rpm full sized drives cool. No problems using 2sata power connectors. If you use thinner drives than full size 3.5 in HDs, you will have trouble with the drives engaging the power and data connectors. You would want to have the drive cage horizontal with the connectors at the bottom so that the internal webs support the drives in the correct position for engagement. THIS COMPANY IS NOT SOME SHADY CHINESE JUNK PEDDLER. THEY ARE AN ISO CERTIFIED MANUFACTURER. Don’t knock something you have no knowledge about. There is way too many “Computer Experts” that are nothing more than simple power users who think they know everything.